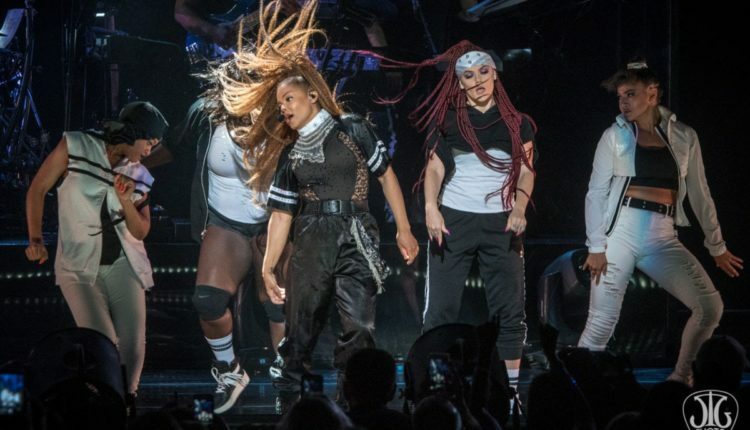 Janet Jackson popped and locked to some of the best-known music from the 1980s and 1990s at Saratoga Performing Arts Center on Thursday, July 26th as she brought her “State of the World Tour” to Saratoga. 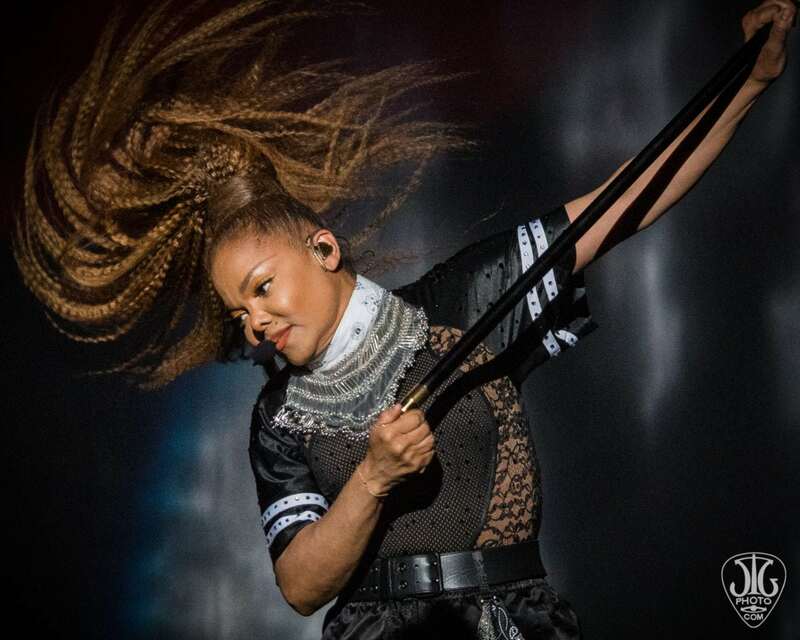 After two recent tours were canceled (one due to her pregnancy), fans were anxious to see the fifty-two-year-old Ms. Jackson here in the capital district. Her traveling DJ opened with just enough songs to get the audience bumping before Jackson made her entrance a little after 8:30 pm. Standing behind a dramatic curtain, her silhouette drew gasps and screams from the crowd. 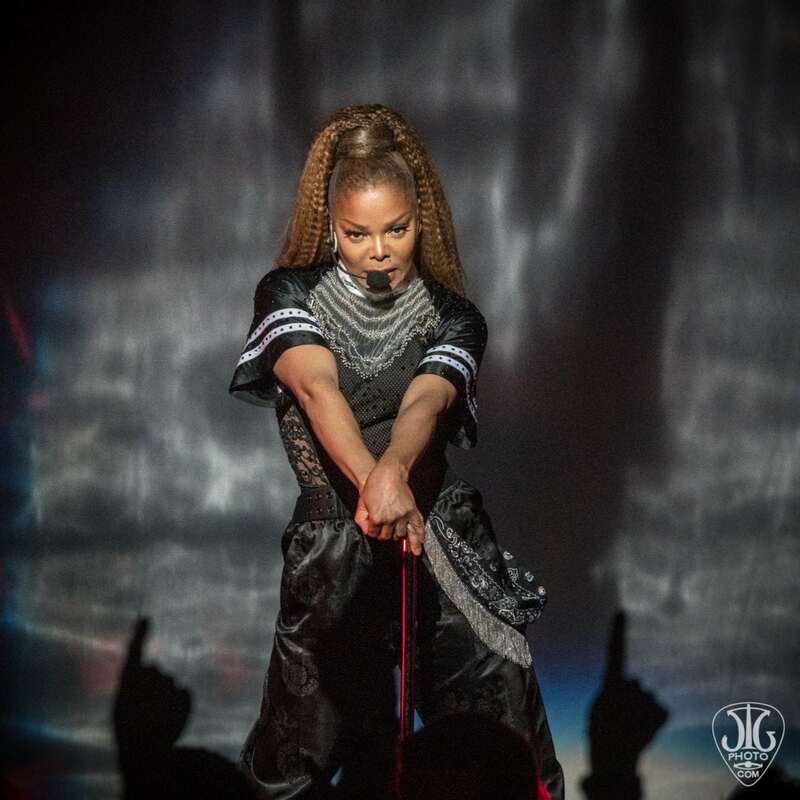 The curtain dropped, and Jackson immediately established the tone for the night with “The Skin Game (Part 1),” dancing with a film loop about civil rights and knowledge as power while she strutted around the stage demanding respect. 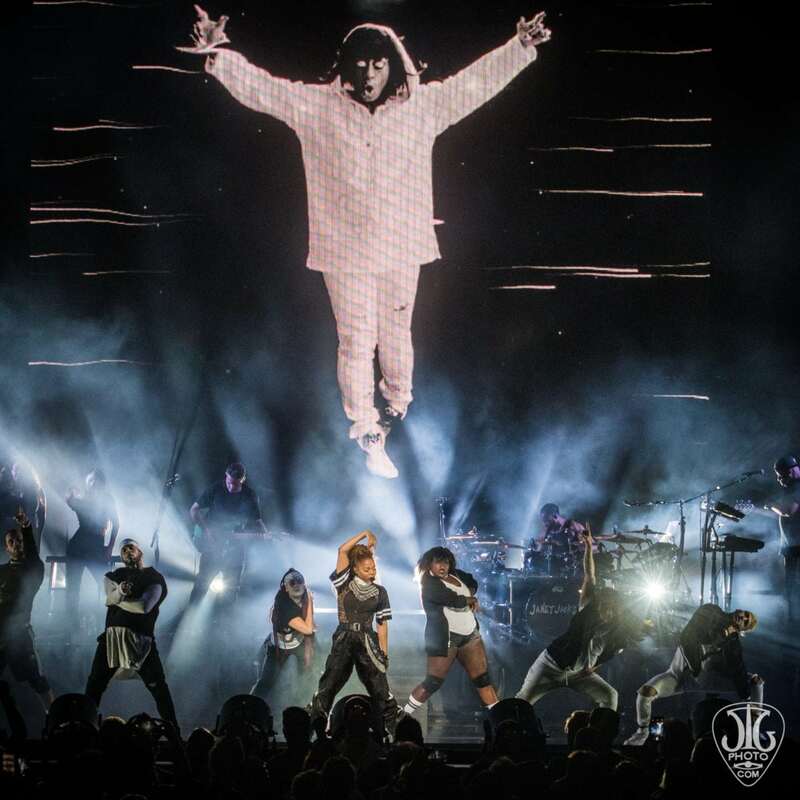 An unusual start to a pop show, Jackson’s message was clear and deliberate. She doesn’t shy away from hard topics, especially racism. She started the show with a clear statement that knowledge is what we need to seek out justice. The message was credible and demonstrated integrity within the audience; fans were nodding along, chanting for justice and social change as Jackson sang about banishing illiteracy and ignorance. Completely in control, Jackson moved from dance song to dance song, guiding the audience through the past decades of music. Fans could not get enough of the dance show, which combined with the lights, video, and music demonstrated both artistry and athleticism. 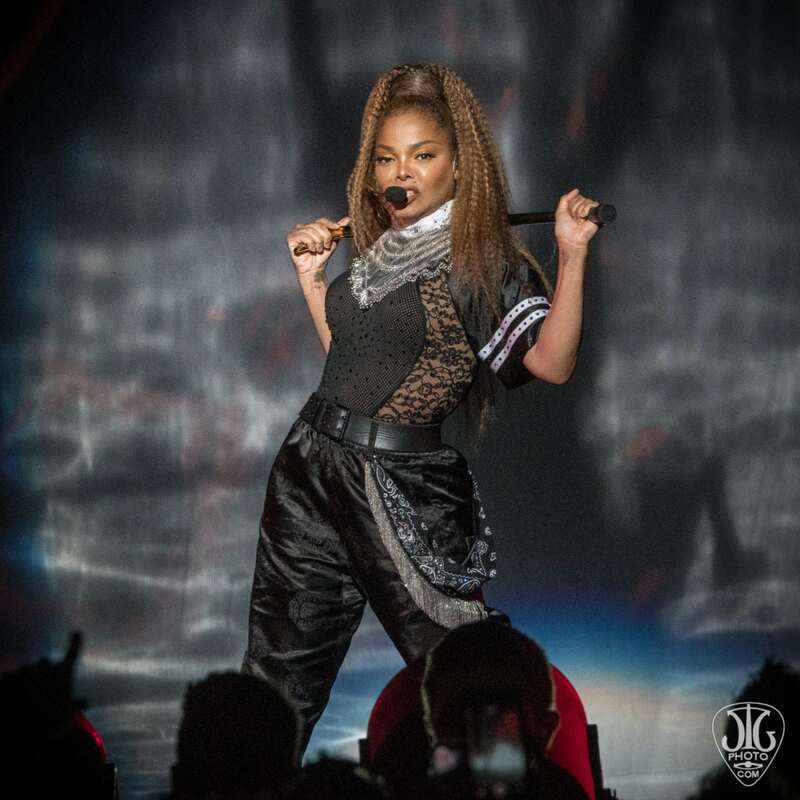 After reaching a fevered pitch with a medley of “Control/What Have You Done for Me Lately/The Pleasure Principle,” music guided us through an interlude with elements of “Damm Baby” and “Night,” keeping the energy high as Jackson re-entered for some love songs. Energy stayed incredibly high throughout the 90-minute show. With three more music interludes offering brief breaks for Jackson and her dancers, the high energy didn’t drop. Highlights of the night included a cover of her brother’s “Scream” and an encore “State of the World.” This is a must-see show for fans of anyone who likes hip-hop dancing; the choreography was demanding and energizing. Jackson spoke very little but referenced Saratoga a few times. She was on a mission, moving methodically and purposefully through her songs to remind people that she is to be respected. Jackson has had some hard years as a performer. After a costume “malfunction” at the Superbowl and constant references to her famous family, some performers would have quietly retired to the shadows. But not Jackson. 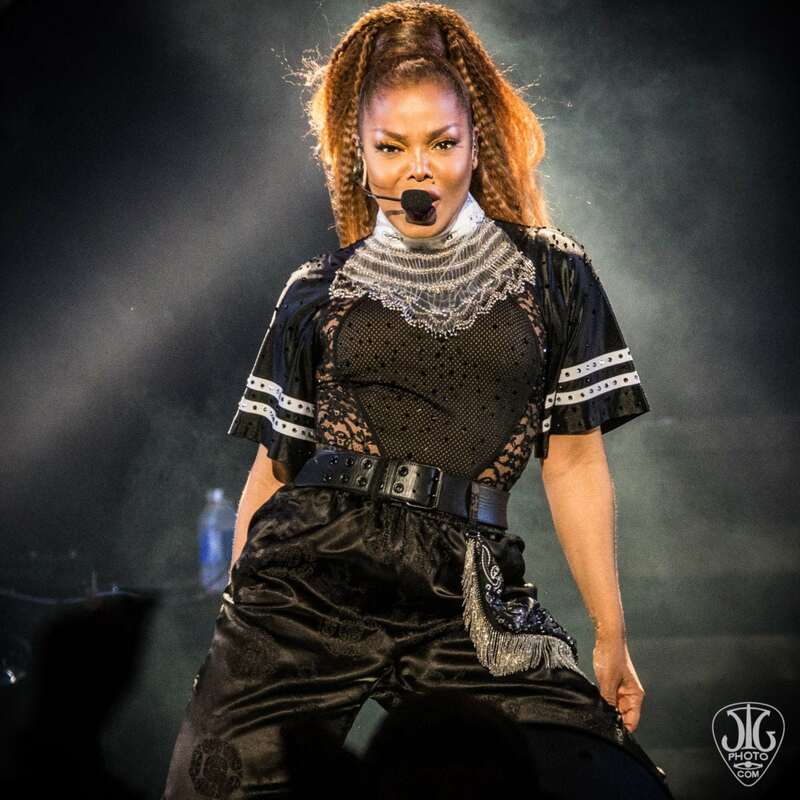 Janet Jackson continues to demand respect with the authority of a gifted dancer and vocalist. She faced the issue of racism head-on, modeling for fans how to demand justice. Her loyal fans were treated to a spectacular show, and also told once again to be authentic, speak our truths, and hold heads high with smiles crossing their lips.